Ken Peterson is a graduate of the United States Military Academy at West Point. Following graduation his first duty station was Fort Eustis, VA. Ken was selected early for Command and was honored to serve as the personal Aide-de-Camp to the Commanding General of Fort Dix, NJ. He served five years as a US Army officer and rose to the rank of Captain prior to his departure. Ken holds a Masters in Business Administration (MBA) from the Kellogg School at Northwestern University. He also earned the Chartered Financial Analyst (CFA) and Chartered Financial Consultant (ChFC) designations. Ken began his private sector career as a corporate finance professional with The Prudential. There he was responsible for investing a portion of the company’s approximately $300 billion in assets in a wide variety of financial instruments. He traveled extensively and met with senior government officials and business leaders in the US and overseas to explore ways to provide capital to various business ventures and to finance economic development in emerging markets. He also served as a founding member of Prudential’s Financial Restructuring Group, which managed a portfolio of distressed and defaulted bond investments, and negotiated debt restructurings. Eventually Ken decided to leave Prudential to accept a position as head of the US high yield bond group of Fortis, Inc. When Fortis decided to sell its mutual fund and annuity group, he accepted a position as Managing Director, and partner, with J&W Seligman & Co., Inc, a diversified investment management company headquartered in New York City. Ken was in his office in New York when the tragic events of September 11, 2001 unfolded. He spent the days that followed managing through the crisis while the financial markets were in a state of turmoil. A few years later, Ken decided to return to Virginia and form a private investment operation. 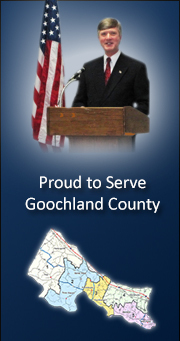 Ken returned to public service in 2012 when he was elected to the Goochland County Board of Supervisors, serving as Chairman in 2013. He also served as Chairman of the Richmond Regional Planning District Commission in 2015, and served as Co-chairman of the 2014 Inter-City visit to Tampa, FL., sponsored by the Greater Richmond Chamber of Commerce. Ken and his wife Joan reside in Manakin-Sabot, Goochland County, Virginia where they are engaged in a variety of community activities. 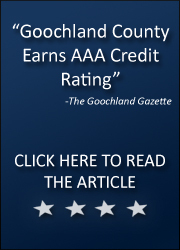 Ken belongs to the Goochland American Legion Post 215, and has completed the Goochland Leadership Enterprise and the Goochland Sheriff’s Citizen Academy. He also serves as President of the state pension board for his church. Ken and Joan have been married for over 25 years and are blessed with two children; Kathryn, a graduate of Purdue University working as a Human Resources Consultant, and Douglas, a graduate of Northwestern University with an MBA from the University of Texas, serving as a management consultant with Deloitte & Touche.